Materials company Sabic says that it is highlighting technologies that help address sustainability challenges as part of Abu Dhabi Sustainability Week (ADSW) 2019. The Sabic delegation is presenting several working papers on energy management and conservation, sustainability solutions, and new technologies for CO2 utilization. 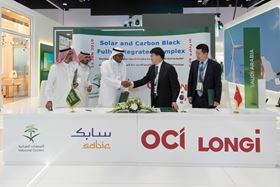 Sabic has also signed a Memorandum of Understanding (MoU) with the National Industrial Clusters Development Program, the Korean OCI and the Chinese LONGI Green Technologies to develop manufacturing and production facilities in Saudi Arabia. This story is reprinted from material from Sabic, with editorial changes made by Materials Today. The views expressed in this article do not necessarily represent those of Elsevier. Cerafiltec, which makes water filters, has developed a filtration module molded from Sabic’s Noryl glass-reinforced polyphenylene ether (PPE) resin. Sabic says that it will be exhibiting a range of its products for the aerospace industry at the Aircraft Interiors Expo. SABIC says that it has been recognized as one of the world’s most valuable brands in the chemicals industry.